Whales are from the order Cetacea, which also includes the dolphins and porpoises. The order contains two sub-orders, Mysticeti and Odontoceti, over which the whale species are spread. New discoveries of species has increased recently although due to the nature of whales studying them prevents easily relating the species to another, this has led to several publications stating different facts. 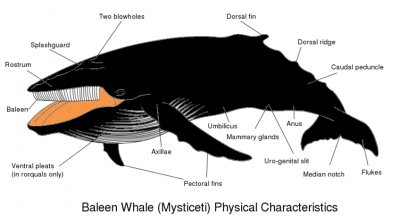 The physical features of the baleen whales, in this case a Humpback whale. The baleen whales form the Mysticeti, one of two suborders of the Cetacea (whales, dolphins and porpoises). Baleen whales are characterized by having baleen plates for filtering food from water, rather than having teeth. Living Mysticeti species have teeth only during the embryonal phase. Fossil Mysticeti had teeth before baleen evolved. In baleen whales, unlike with most other marine mammals, the female is larger than the male, and the largest animal ever to have lived is found in this group. The suborder contains four families and fourteen fully known species. Balaenoptera omurai is a recent discovery and little is known of it, no common name has been assigned to it yet. The scientific name derives from the Greek word mystax, which means "moustache". The physical features of the toothed whales, in this case a bottlenose dolphin. The toothed whales form the Odontoceti, the second sub-order of the cetaceans. As the name suggests, the suborder is characterized by having teeth, rather than baleen. Toothed whales are active hunters, feeding on fish, squid, and in some cases marine mammals. As well as the following whales, the sub-order also contains the porpoises and dolphins. Toothed whales have a single blowhole on the top of the head, which was formed from one of the nostrils becoming dominant over the other, rather than from them both fusing together. Another group of whales was the Archaeoceti, which is now extinct, these were believed to be some of the earliest whales which gave rise to modern whales. Mainly only genera are known and no specific species. Not all extinct whales are from the Archaeoceti group. These unconfirmed species of whales can also be considered cryptids. Rice, Dale W. (1998). "Marine mammals of the world: systematics and distribution": 231pp. Mead, James G. and Robert L. Brownell, Jr (November 16, 2005). in Wilson, D. E., and Reeder, D. M. (eds): Mammal Species of the World, 3rd edition, Johns Hopkins University Press, 723-743. ISBN 0-801-88221-4. This page was last modified on 19 September 2010, at 23:19.